Aerial Allusions is another international dance show at this year’s Toronto Fringe Festiva, traveling to us from San Francisco, via Ottawa and New York, with traces of creator Azana Pilar’s many travels around the world. Azana Pilar is an aerialist, working for years in bars, nightclubs and private events, while working a day job in construction. The work she brings to the Toronto, Aerial Allusions began its run in New York in February of this year and moved on to the Ottawa Fringe Festival. She is a nomad, traveling and working wherever she goes and in a variety of fields. Her sideline in construction has informed Aerial Allusions, incorporating tools and ladders, merging her vast experiences into fresh forms. 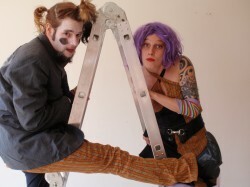 Aerial Allusions draws on dance, physical theatre, clown and aerials to explore relationships between couples. Azana creates through trial and error, an approach which is not rejected once the performances and touring begin. The performers continue to plumb the possibilities of the material they’ve created. Though Azana is the choreographer, she clearly has a collaborative spirit. Azana also stresses the importance of music as a first step for choreography. She spends a lot of time seeking out the right music, sound that fits with her particular perspective on the subject matter. Azana has been performing for quite a while now but Aerial Allusions is her first major self-production. “Aerial Allusions is not a ‘dance show’. Deep questions are asked, there is philosophy, there is confusion, love and hate. The medium is mostly physical…it is a combination of various performance styles and I feel it’s a dynamic way to perform. I try to burst through the constraints of [traditional] theatre, or [traditional] dance and fuse many ways of expressing on stage. And I think that’s why we all take part in the Fringe. It really is important to get it out, on its feet, into the world.